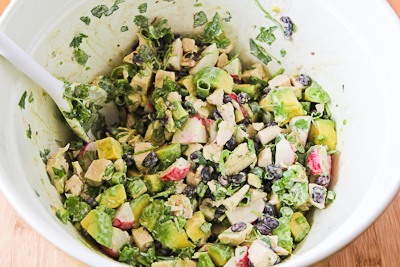 Grab some radishes and make this Chicken, Black Bean, Avocado, and Radish Salad with Lime and Cilantro. 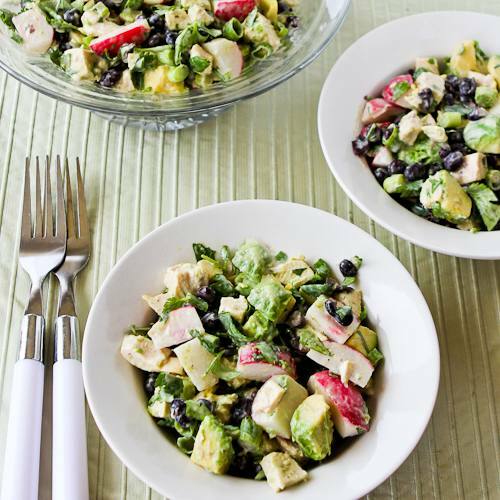 The salad is South Beach Diet Phase One; gluten-free, and dairy-free; for a lower-carb salad use more chicken, avocado, and radishes, and less beans. And if you’re a cilantro hater I’d just leave it out and double the green onion. Use the Recipes-by-Diet-Type Index to find more recipes like this one. I made this Chicken, Black Bean, Avocado, and Radish Salad with Lime and Cilantro several times to get the flavors just right, and when I was making the final version (with the addition of radishes for color and a little crunch) my brother Mark, his wife Lisa, and their daughter-in-law Lindy dropped by just as I was starting the recipe. I convinced them to hang around while I made the salad and took photos, which might be the best excuse ever for a rather messy-looking bowl of salad that could have been styled a bit more carefully! Being close enough for family members to drop in is just one of the things I absolutely love about the new house. And by the way, I fed my visitors this salad, as well as leftovers from a casserole that hasn’t made it to the blog yet, and both dishes were definitely a hit! Rinse 1 can of black beans and let them drain well. 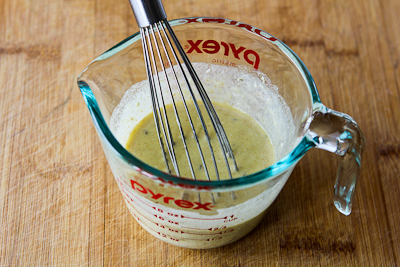 Whisk together the olive oil, mayo, lime juice, cumin, and Green Tabasco Sauce to make the spicy dressing. 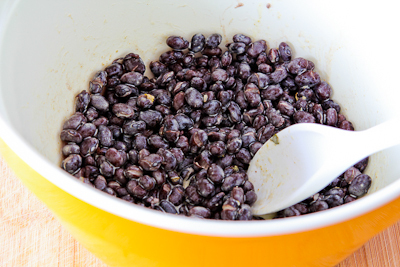 Toss the drained beans with about half the dressing so they can marinate while you prep the other ingredients. 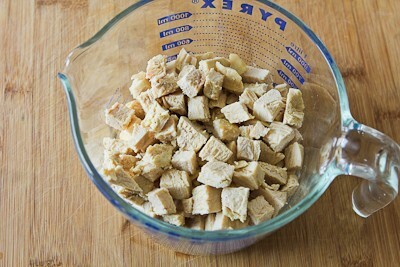 Once it has cooled, dice the chicken into medium-sized pieces. 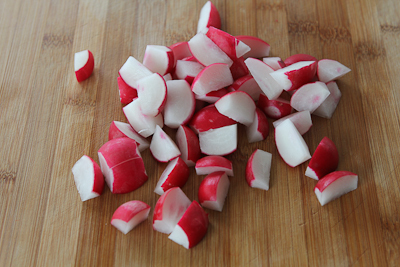 Chop up the radishes, cutting them so each piece has a side with some red showing for color. Mix the chopped green onion and chopped cilantro into the salad. Then gently mix in the chopped avocado, season well with salt and fresh-ground black pepper, and serve. 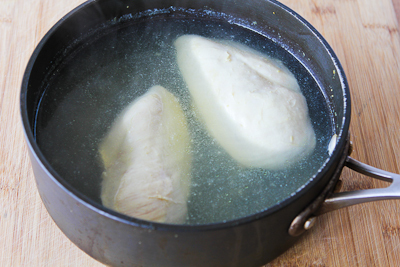 If you don’t have leftover cooked chicken, trim 2 boneless skinless chicken breasts to remove fat and undesirable parts, then poach with barely simmering water covering the chicken for about 15-20 minutes (depending on the thickness of the chicken.) Let chicken cool. While chicken cooks, put black beans into a colander placed in the sink and rinse well with cold water, until no more foam appears. Let beans drain while you whisk together the olive oil, mayo, lime juice, cumin, and Green Tobasco to make the dressing. (I used 2 tsp. of Green Tobasco, but you might want to add one teaspoon and taste before you add the second teaspoon.) Put the well-drained beans into a bowl and toss with about half the dressing, then let beans marinate while you prep other ingredients. Peel avocado and cut into pieces about 1 inch square. 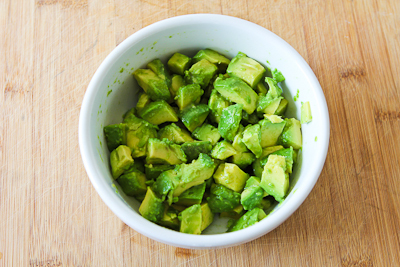 Put the avocado pieces into a small bowl and toss with 1 T fresh lime juice. When the chicken is cool, cut into pieces about 3/4 inch square. Chop up the radishes, cutting them so each piece has some red skin showing for color. Slice green onions and chop cilantro. Add the chicken and chopped radishes to the beans and toss with additional dressing until the salad is as moist as you’d like it. Stir in the sliced green onions and chopped cilantro, then gently stir in the avocado. Season salad well with salt and fresh ground black pepper and serve right away. This will keep for a day in the fridge, but it’s best freshly made. 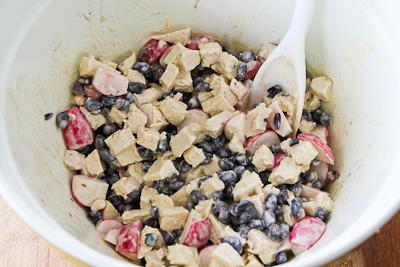 This flavorful salad is loaded with low-glycemic ingredients like chicken, black beans, avocados, and radishes. 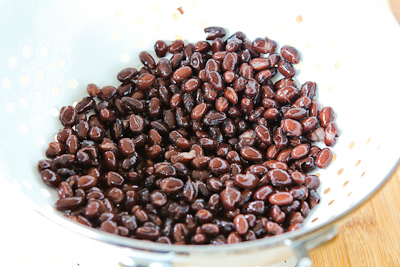 Both beans and avocados are limited foods for the South Beach Diet, but if you make this salad serve six as recommended, you can eat this for any phase of the diet. For a lower-carb version use less beans and more chicken, avocado, and radishes. I took this to a pitch-in dinner tonight; partly because my husband and I are doing South Beach and we weren't sure what there would be for us to eat. Well, we didn't have a lot to eat because everyone loved it and it was gone before we got enough to count as dinner! Everyone wanted the recipe. I made this over the weekend and it was absolutely delicious! I would try sour cream or Greek yogurt, maybe with a few teaspoons of olive oil added. My husband hates mayo…any substitute ideas? Matthew, thanks for the nice feedback; so glad you enjoyed it! Dear Kalyn, I've tried it and it's really delicious! I recommend it for salad lovers! 🙂 Thank you for sharing the recipe! Jeanette, I am loving being closer to most of my family. Glad you like the salad. I'm a big radish fan! So glad to hear you're loving your new home. What fun having family so close by – they must love being your taste testers. I always gets lots of radishes in my CSA Box during the summer and run out of ideas with what to do with them. Love how pretty they look in your chicken salad. KatesMom, I think this would still be great without cilantro, but I would probably double the green onions. I'll add that to the recipe. This recipe sounded fantastic to me, until I got to the cilantro. I've found that there are a number of recipes where if you leave out the cilantro, you're left with something pretty tasteless. This one sounds like it might still have lots of flavor, even without the dreaded cilantro. Would you sub something else, double the green onion, just leave it out, or look for a different recipe? Thanks Kevin. Definitely some of my favorite ingredients! I am really liking the flavours in this salad! Thanks Joanne, Pam, and Lydia. So glad you like it. The lime, cumin and Tabasco in the dressing really appeals to me. I can imagine how good that would be on all sorts of summer salads. I have just recently discovered that I love radishes! So, this is perfect! 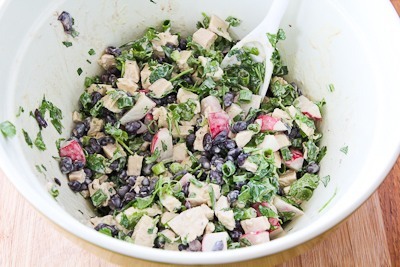 LOVE this take on chicken salad! The flavors are so much better than traditional versions…or maybe I"m just a sucker for anything with black beans and avocado!